Eating a healthy diet on a daily basis can be confusing at the best of times, especially if you want to improve your diet for pregnancy. During pregnancy and breastfeeding it can be overwhelming and a little scary on whether you are making the right nutritional choices for a healthy pre/post pregnancy diet. How well you eat during and after pregnancy can have a big impact on you and your baby’s health. 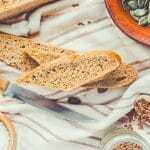 Depending on what you are eating on a daily basis it is possible that you may not be meeting your nutritional requirements for optimal health. Using a protein powder during pregnancy can be an easy way to quickly access valuable nutrients at a time that you may not feel like a main meal. As you can imagine, your nutritional requirements dramatically increase during pregnancy. Your baby needs the extra nutrients to grow and develop with all available nutrients going to the baby first… and you second. This can lead to nutritional deficiencies that can leave you feeling tired and run down during pregnancy and result in a slower recovery. 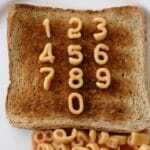 With this in mind, each meal needs to be nutrient rich to cope with the increased nutritional demands. Choosing the best protein powder for pregnancy can be confusing as many brands claim to be the best and promise the earth using fancy marketing. Unfortunately many high street protein powders contain hidden chemicals, fillers, thickeners and artificial sweeteners. At 180 Nutrition our protein powders for pregnancy are different as they are made from 100% whole food ingredients. Our Superfood Protein Blends will make the ideal choice of protein supplement while pregnant or breastfeeding. All of our ingredients are derived from natural food sources making it a fantastic source of nutrition to help you get those extra nutrients and valuable proteins daily. Protein is an essential macro-nutrient (from the protein, fat and carbohydrate family) needed for optimum health, it is even more essential during pregnancy. It was reviewed and recommended by a leading pregnancy website here. 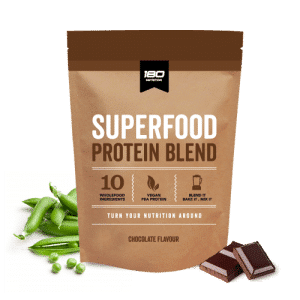 If you believe that 100% natural ingredients are better for you than products packed with preservatives, chemicals, artificial flavours and colours… then you are in the right place as our Superfood Protein Blend ticks all of those boxes with only real food ingredients. Our protein blends are completely free of all synthetic ingredients, sugars & preservatives. 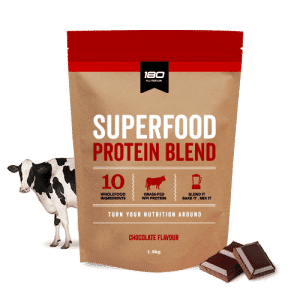 It’s a whole-food protein supplement that contains essential micro-nutrients, fatty acids, antioxidants and fibre to assist metabolic rates and keep your digestive system functioning at optimum levels, a whole-food protein supplement that is actually healthy for you! You can simply enjoy a Superfood smoothie for breakfast with your favourite fruit which can be prepared in under 2 minutes or snack on it throughout the day. We have dozens of healthy recipes for you to choose from here.